The Dewoitine 371 was developed in the mid 1930's and quite typical of fighter development of the time. It seems that the 'parasol' wing was very much in vogue during that period. You see a number of aircraft of this design being built. It was the next logical step between biplane and low wing monoplane. However, it was easily outclassed by the later which had numerous advantages. The 371 was for the French Air Force with the 373 and 376 being developed for the Navy. The 372 was an export version that was built for the Lithuanian AF. However, these were never delivered, instead being sent to Spain, though a few were painted in Lithuanian markings prior to being sent. The Lithuanians received D.501s in their stead. By all accounts, the 371 was a fun plane to fly and so enjoyed its short service in the French AF. However, by the time the war started it was already in secondary units as it was heavily outclassed by more modern aircraft. For those of you unfamiliar with Azur, they are a part of the many model lines produced by the MPM conglomeration. Azur concentrates on French subjects and as such do not usually sell that well in the US, though European sales are quite good. The kit itself is quite typical of any MPM kit in that they are short run and seem to get better with each new release. Surface detailing is good with petite engraved lines that will disappear under any sanding that you'll be doing. The fabric surfaces are a bit over-pronounced so you may want to sand these down a bit. The parts also have flash on most of them and the mating surfaces will have to be sanded flat as well. Care will need to be taken when removing the thinner parts from the sprues as experience has shown these to be rather fragile. You get a bag of resin parts that make up the engine and cowling. The engine is a generic one with a central block on which you glue the separate cylinders. It will be interesting to see if the engine actually fits into the very nicely done resin cowling that is also provided. Another small resin block contains a control stick, rudder pedals and a side console. 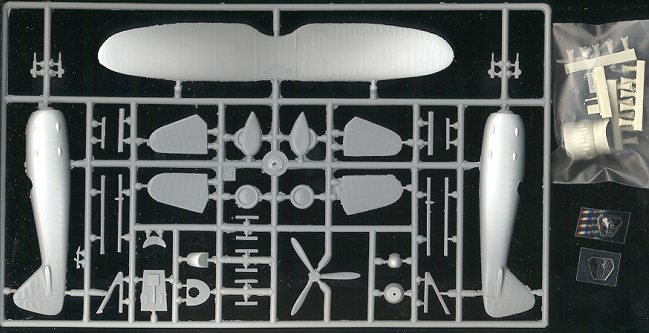 Some of the smaller parts, such as the guns and engine exhaust, will have to be made of stretched sprue. This shouldn't be a problem. If you are contemplating a short run kit, you should have the skill required to provide these bits. You get two vacuformed windscreens, which is nice as they are quite small. Instructions are quite nicely done and contain several exploded views to aid in construction. Colors are given For the overall aircraft. You are on your own for the interior! Optional parts are given for the two variants and consist of different tailplanes, main wheels, and gun installations. Decals are superb and by Propagteam. There are markings for four aircraft. One is the box art palne from SPA 37 in 1937. This is listed as green upper and silver undersides. Two Spanish Civil war planes are next with only tail code and side numbers provided. The wing and tail insignia will have to be painted. Break out the purple!! Finally, an undelivered Lithuanian version is also provided, again in green and silver, though the pattern is a bit different. Probably the only downside to the markings is that the blue in the French markings is again too light to my eye and references. 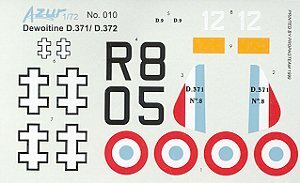 However, replacing the tail decal will be difficult so it will probably be better to use the too light ones just to keep things the same. 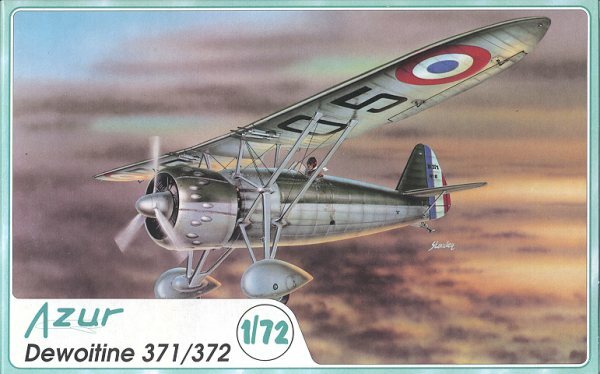 Another interesting model of a plane I had not heard of before from Azur. If you are interested in the subject and can handle the challenges and frustrations of short run kits, this one is for you. If you would like your product reviewed fairly and fairly quickly by asite that has thousands of visits a day, please contactme or see other details in the Note toContributors.